The second year: Residence or Greek life? Home » Campus » The second year: Residence or Greek life? To go Greek, or not to go Greek: With the two-year on-campus living requirement, that is the question. For first-year students debating living in an on-campus residence hall for another year or joining and living in the house of one of 30 Ohio State Greek organizations approved to house second-year students, there’s no one-size-fits-all answer, and there are a lot of factors to consider. Uhrig said it is important to realize that costs cannot be directly compared because some organizations might include additional fees in the price tag that other organizations would have members pay later. With this in mind, according to the 2017-18 Panhellenic Lookbook, Delta Gamma had the lowest live-in fee of the PHA sororities at $2,300 and Delta Zeta had the highest at $5,770. Of the Interfraternity Council organizations Ohio State manages, Sigma Phi Epsilon had the lowest live-in cost starting at $2,000 and Delta Tau Delta had the highest number at $4,208, Uhrig said. The price of an Ohio State on-campus residence hall depends on its rate. The rates are decided based on factors such as the building’s location, layout, room types — whether it has singles, doubles, triples or quads — if the bathrooms are communal and whether the building has air conditioning, said Amy Morrisey, an accounting budget analyst in Student Life financial management. Rate 1 is the most expensive of the three options at $4,174 and Rate 3 is the least expensive at $3,249 for the 2017-18 academic year. Morrisey said a benefit of the residence halls is the individual support. Students have hall directors, assistant hall directors, resident managers, resident advisers and a 24-hour front desk to help them address concerns. Residence halls also hold programs and events to create a community inside the building. Uhrig also said students involved in a learning community, a group of students who live on the same residence hall floor with a common major, career or personal interest, might choose to remain in a residence hall for a second year to get a full two-year experience with the community. “There might be some folks who really love Baker [West] because it’s a really artistic, creative environment,” Uhrig said. However, Butler said members in Greek facilities also receive support and community from the other members of the organization. “For our housed chapters, a lot of them will speak to the experience of just being surrounded by your brothers and sisters that have the shared value of the organization,” Butler said. Butler also said a lot of chapters will make sure that out-of-house members have access to the house at all times to allow them to feel welcome to use the space. Morrisey said the amenities provided by Ohio State for students in a residence hall include utilities, television and cable, maintenance, study lounges, laundry and kitchen facilities and a front desk. 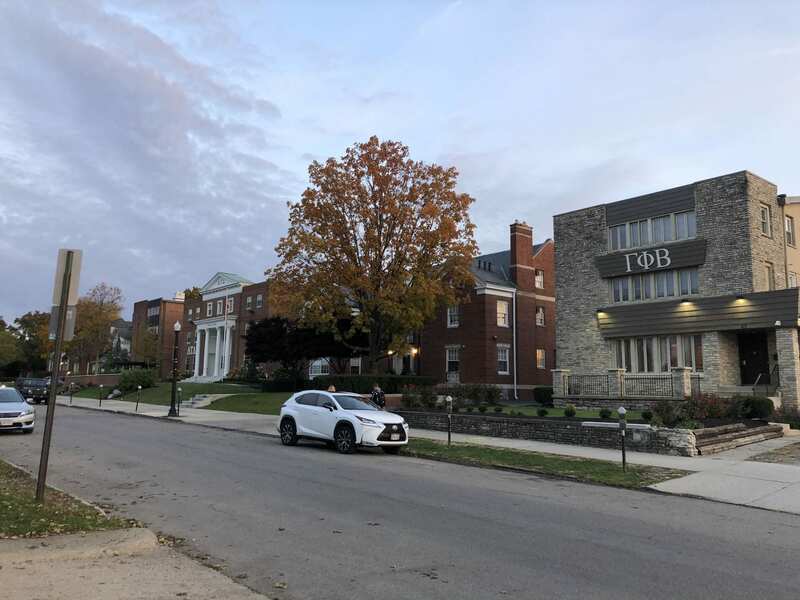 The amenities for the Greek houses managed by Ohio State include television, internet, housekeeping, groundskeeping, pest control and snow removal. Butler said that a majority of facilities have a chef and residents might have access to the kitchen depending on their kitchen license. While residence halls are located on North, South and West campuses, Butler said all Greek facilities are located east of High Street. Uhrig said students can choose a residence hall in order to be closer to their classes. However, Butler said living in a Greek facility would allow members to feel more involved with what’s happening in the chapter, especially if they otherwise would not be spending as much time near campus because of a job or other commitments. Butler said a lot of chapters have meal plans within their facilities. Students with an on-campus meal plan would be able to eat at a variety of locations across campus. Chapters work to accommodate students by allowing them to take sack lunches or request late plates, Butler said. Uhrig encouraged students to talk with other students, family members or other individuals they trust to help them determine what would be best for their individual situation. Butler said she encourages those students interested in Greek life to do their research and talk to the organizations that they’re interested in about membership expectations, including live-in requirements. She also said students have a variety of resources such as Sorority and Fraternity Life, Residence Life and Housing available to them to answer any questions that allow them to make the best decision for their needs.